LOS ANGELES (AP) -- Tony Parker scored 31 points and the San Antonio Spurs led all the way in beating the Los Angeles Clippers 116-90 on Thursday night for their fifth straight victory and first over the Clippers this season. The Spurs improved to an NBA-best 22-10 on the road, where they've also won five in a row. Parker had seven assists and no turnovers in 28 minutes and Danny Green added 15 points. The West-leading Spurs tied their season-best with 59-percent shooting, hit eight 3-pointers and made 22 of 28 free throws. They had lost both previous meetings with the Clippers in November. 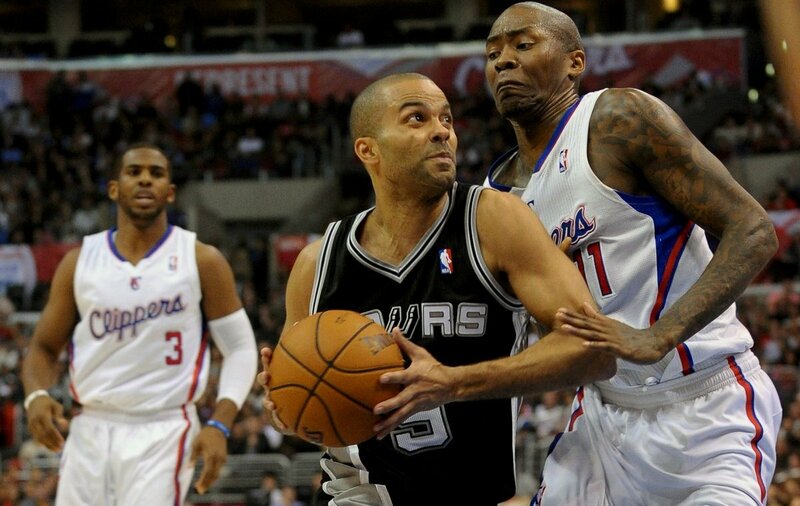 The Spurs led by 28 points to start the fourth quarter, when Parker rested and fans hit the exits in droves. The Clippers equaled their worst loss of the season. San Antonio put on a free-throw shooting clinic in the third quarter, making 16 of 20, including 12 during a 14-4 run that extended its lead to 81-53. The Spurs shot 63 percent to lead 58-43 at halftime. Parker scored 17 points in the half, while Griffin was the only Clipper in double figures with 13 points. Paul didn't make his first basket until the final 3 minutes of the second quarter. San Antonio made its first six shots to start the game and used a 17-4 run, including seven by Manu Ginobili, to close out the first quarter leading 34-21. NOTES: San Antonio improved to 6-1 on its nine-game rodeo trip. ... The Clippers dropped to 21-6 at home. ... Spurs F-G Stephen Jackson played for the first time since his wife had a miscarriage. He had left the team in Chicago on Feb. 11. ... Spurs F Kawhi Leonard was held out for precautionary reasons because of soreness in his left knee, the same reason he missed 16 games earlier in the season. ... Adam Silver, who will succeed David Stern as NBA commish, attended the game. ... There was a moment of silence for late Lakers owner Jerry Buss, who died Monday. 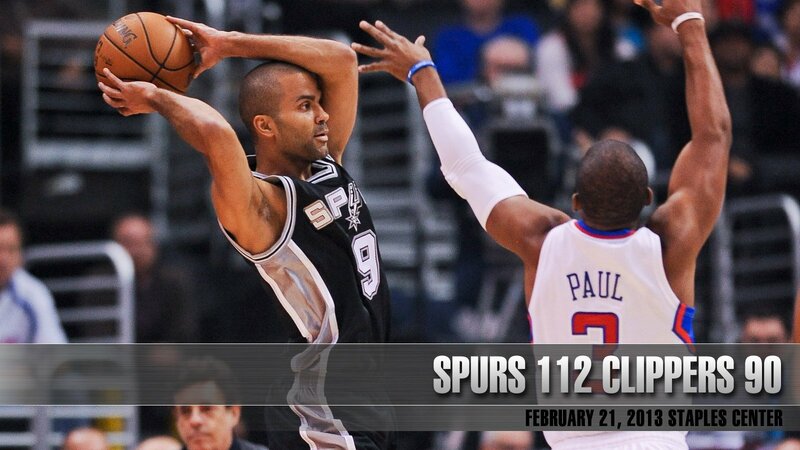 Los Spurs, con diez puntos de Ginóbili y otro partidazo de Parker, derrotaron a los Clippers por 26 en Los Angeles. Consiguieron su quinto triunfo al hilo para mantener el mejor récord de la liga. Y sí. No bajan los brazos… Otro triunfazo. De principio a fin. Con 31 puntos de Tony Parker, los Spurs tuvo ventaja todo el juego para derrotar este jueves por 116-90 a los Clippers en Los Angeles, conseguir su quinto triunfo seguido y mantener el mejor récord de la liga. Van dos al hilo después del receso por el All Star de Houston. La excelente cosecha en la Gira del Rodeo coloca 44-12 a San Antonio en la fase regular (22-10 como visitantes) en una campaña que hace ilusionar de cara a los playoffs. Manu Ginóbili puso su granito para ganarle por primera vez a los Clippers (habían perdido dos en noviembre): en 17 minutos hizo diez puntos (2-4 dobles, 1-1 triples y 3-4 libres). Siete llegaron en el cuarto inicial. Además, bajó tres rebotes y sumó dos asistencias, aunque perdió cuatro pelotas. Popovich no se vio obligado a darle más protagonismo al bahiense porque el partido siempre estuvo bajo control. Parker fue la figura con 12-16 en tiros de cancha, mientras que Danny Green colaboró con 15 puntos a su lado y Tim Duncan aportó nueve en 16 minutos. Barnes (18), Griffin (17) y Crawford (15) dieron pelea en el local (ahora 39-18).